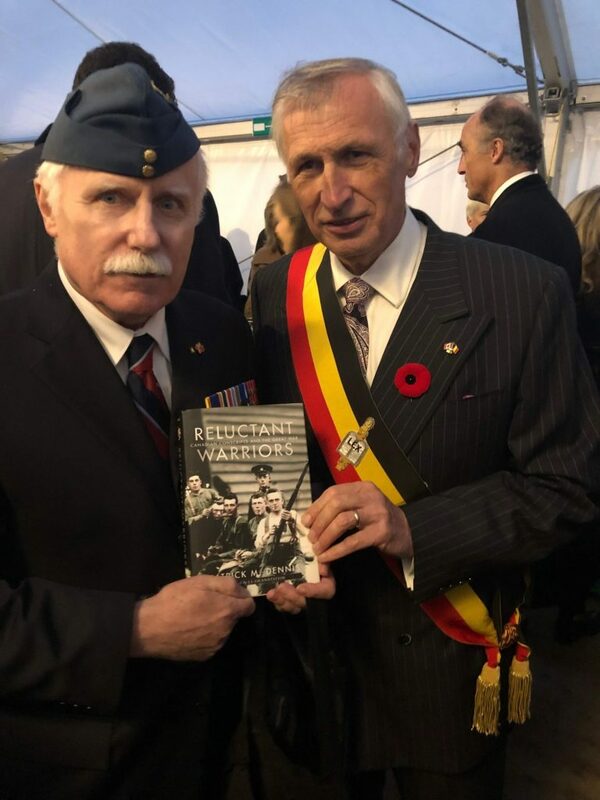 Presenting Mayor Benoit Friart with a copy of Reluctant Warriors at the opening of the Price Memorial. Ceremony marking the 100th anniversary of the end of the Great War. November 10, 2018. Grave of Private George Lawrence Price (St. Symphorien Cemetery, Belgium), the last Commonwealth soldier to be killed in combat during the Great War. 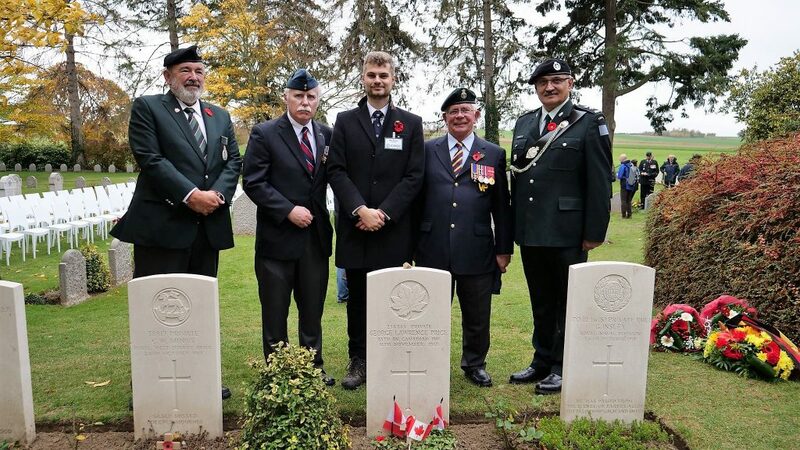 Left to right: Bob Remple (past president of the Regimental Association – British Columbia Regiment); Patrick Dennis; Max Dutton (Assistant Historian – Commonwealth War Graves Commission); Keith Maxwell (co-author Swift and Strong: A Pictorial History of the British Columbia Regiment); and Farid Rohani (newly appointed Honorary Lieutenant-Colonel of the BCR). Ceremony marking the 100th anniversary of the end of the Great War. November 10, 2018. St. Symphorien Cemetery. George Barkhouse, nephew and namesake of Private George Lawrence Price, the last Commonwealth soldier to be killed in combat during the Great War. Grave of Private Russell Crarey at Niagara Cemetery, Iwuy, France. Killed in action on 11 October 1918. 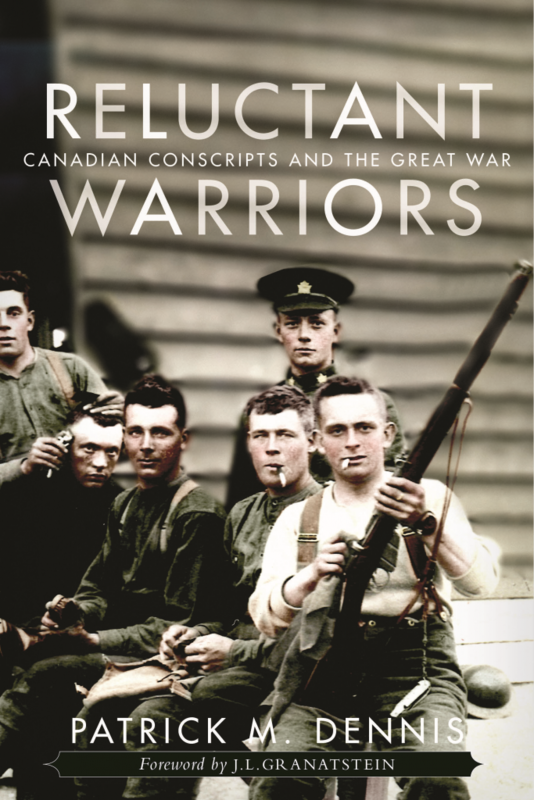 Crarey was a conscript and is featured on the cover of Reluctant Warriors: Canadian Conscripts and the Great War (third from the left).